The 5-Fulton could get less crowded this fall after Muni launches a package of speed improvements [PDF] in a pilot of the Transit Effectiveness Project. 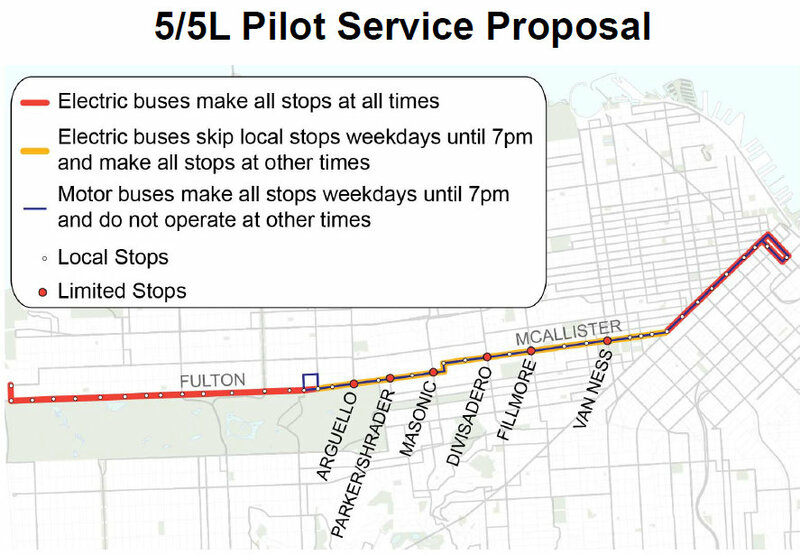 The SFMTA plans to launch a 5-Fulton Limited line, remove some excess stops, move stops across intersections for smoother loading, and extend the length of bus zones to make room for double bus loading. Early next year, planners said bus bulb-outs would be also be added at seven intersections as part of a re-paving project on Fulton west of 25th Avenue. A road diet would also be implemented on Fulton between Stanyan Street and Central Avenue, reducing four traffic lanes to two, plus turn lanes. 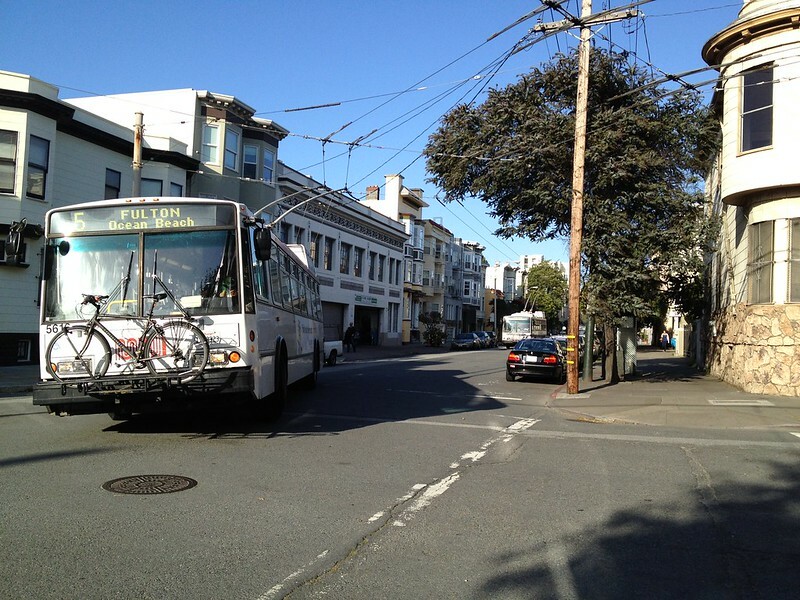 Aside from calming traffic, SFMTA planners said that change would allow for wider traffic lanes to safely fit buses. Currently, the buses must squeeze into 9-foot lanes, resulting in a high frequency of collisions with cars. The new lanes would be 12.5 feet wide. The new 5-Limited would run the entire length of the route using the 5’s regular electric trolley coaches, serving only the six most heavily-used stops between Market Street and 6th Avenue, running that stretch 17 percent faster than the existing local service, planners said. From the Transbay Terminal to the beach, the 5L would run 11 percent faster than the existing service. Local bus service, which would be served with hybrid motor buses, would only run as far west as 6th Avenue, and run that stretch 7 percent faster. That means anyone looking to use a local stop on the middle stretch east of 6th, coming to or from the western stretch, would have to transfer between a 5L bus and a 5-local, though planners said relatively few riders seem to make such trips. The 5-Limited would stop running at 7 p.m., after which electric trolley coaches would serve every stop on the line. With the 5L carrying the bulk of rush-hour commuters on the route at a faster clip, Muni planners say the improvements will go a long way toward reducing crowding. At daytime hours, between 6 a.m. to 6 p.m., the 5 currently runs at an average speed of just 9 mph, said SFMTA planner Dustin White. The eight proposed stop removals (in each direction) would require only 9 percent of 5-Fulton riders to use a different stop, White said. On the Richmond stretch of the line, between La Playa Street and Arguello Boulevard, the average space between stops would be expanded from 2.3 blocks to 3 blocks, or 710 feet to 930 feet. Between Arguello and Market, where blocks are longer, average stop spacing would increase from 1.5 blocks to 2 blocks, or 730 feet to 960 feet. As Streetsblog has reported, 70 percent of Muni stops are closer together than the agency’s own guidelines dictate, and 61 percent of riders in a survey said they’d be willing to walk a bit further for a faster trip. Proposals to remove bus stops have often faced strong opposition from the riders who use them — especially elderly and disabled riders, though at yesterday’s meeting, only one man made such a complaint. The most contentious issue raised by attendees at the meeting was the proposed removal of roughly 30 car parking spaces, mainly for the extension of 23 bus stop zones. Planners said that measure is necessary to keep the line running smoothly, as it would allow local and limited-stop buses to load at shared stops at the same time, and make it easier for local bus drivers to pull close enough to the curb to allow limited-stop buses to pass them. At intersections with traffic signals, any bus stops currently on the near-side of intersections would be moved to the far side to allow buses to clear the signal before loading and pull up to the curb more easily. At intersections with stops signs, far-side stops would be moved near-side instead, so that buses don’t need to stop twice. Right-turn lanes would also be added at five intersections to prevent right-turning drivers from holding up buses, White said. Planners are also looking to reduce blockages from semi trucks loading at a Lucky supermarket dock on Central, possibly by removing curbside parking to make room or cracking down on truck drivers. That parking removal proposal roused up opposition form several attendees at the meeting. In a few years, the SFMTA plans to add more permanent TEP improvements to the 5, including more bus bulb-outs and overhead wires that would allow electric trolleys to run on the new local service line. The 5-Limited is expected to launch in October. I think it’s great a road diet will be done on Fulton between Stanyan and Central. The four lanes are narrow (just like 25th Avenue when it used to be four lanes), and the double parking from Masonic to Central made it scary. Very sensible. My only minor pet peeve is that Muni views limited service as a daytime-only solution. This reflects a general tendency to fixate on the commute, when Muni is actually an all-day (and night) network. People want to get there fast and reliably just as much at 8 p.m. as at 5 p.m. This is long overdue – so happy to see it happening though. I hope they don’t give into pressure of losing 30 precious parking spots to store cars rather than have an effective transit system. This is a great proposal and I wish we could push these out to other lines more quickly! I’m still a bit concerned with the operation of the middle segment, but I’m encouraged that adjustments can be made if things dont work out exactly as planned. And while I like the improved stop spacing, I almost want to push for even more! The one anomaly I see in stop spacing is how there remain stops at both 28th and 30th Ave. I almost think it would be better to serve this with a single stop at 29th. This is great. The road diet on fulton has been so badly needed for so many years. Has there been any talk of extending that road diet eastward to broderick and in the process extending the fulton bike lanes to masonic? With the bikeways going in on masonic, this will be an important connection to make. Agreed – this is long over due. The lanes between Masonic and Central are so narrow that they aren’t even used as such, and most everyone crosses the line. From Masonic to Stanyan, there’s a lot of pedestrian crossing and not much traffic control. A stoplight or two would be a good idea. This is a great project in so many ways and it is long overdue, but at least the improvements are scheduled to take place soon. Thanks for covering this, streetsblog. -30th is an entrance to Golden Gate Park and has a traffic signal making it easier for pedestrians to cross compared to 29th. Can they please extend the road diet on Fulton through Baker? There is no reason to have two westbound lanes from Baker through Central. I’d like more space in front of my house, please. Why are the notification posters different for every corner of the block encompassing baker/lyon/mcallister/fulton? Why not have one public notice with all proposed changes that also includes a diagram of proposed street section changes? Please don’t abuse the pilot project program by fast-tracking some major changes without appropriate neighborhood feedback. I live on Mcallister between Baker and Fulton and all of the changes proposed on the different posters will affect me in one form or another, so why did I have to walk around the block and read all of the different postings to figure out all of the proposed changes? Once this is done can we remove a few of the dozens of stops on the Hayes 21 and remove a couple of the stops on the SAME block. Pretty please? Will be interesting to see how it plays out. I’m a Richmond resident who commutes to Powell everyday and my home stop was removed. I guess the trip will be a little faster w/ reduced stops but since the limited service doesn’t start until Arguello, not by much (since I will be riding a regular 5). Why not start the 5L service from the beach? regarding the 5 line. i am really upset that the road ‘diet’ has occurred. as someone with a disability, i find the removal of stops between central and divisadero to be especially difficult to get to, and wondered if the decision is driven by those interesting in gaining parking (since the neighborhood has become increasingly gentrified and don’t take the bus), and those who dislike bus stops close to their door (since purchasing their new condo, which didn’t exist a year ago), and noise pollution the stops perpetuates. a stop every two blocks is standard and should continue. what we need are more buses. not less stops. make muni accessible to everyone! also, why wouldn’t the L continue till the 28 at park persidio, and end at around arguello? most of the people riding buses come from the richmond (where rent is cheaper), many people are also interested in connecting to the major 28 line which takes bucket loads of tourists to the golden gate bridge, and for the locals, stonestown and san francisco state university (which boasts over 30,000 students every year). most of the 5 buses are packed with students and tourists getting to the 28! As someone who takes the 5, I appreciate the removal of some of these stops. It is frustrating when the bus is constantly stopping (the 21 is much worse), which makes the trip that much longer. 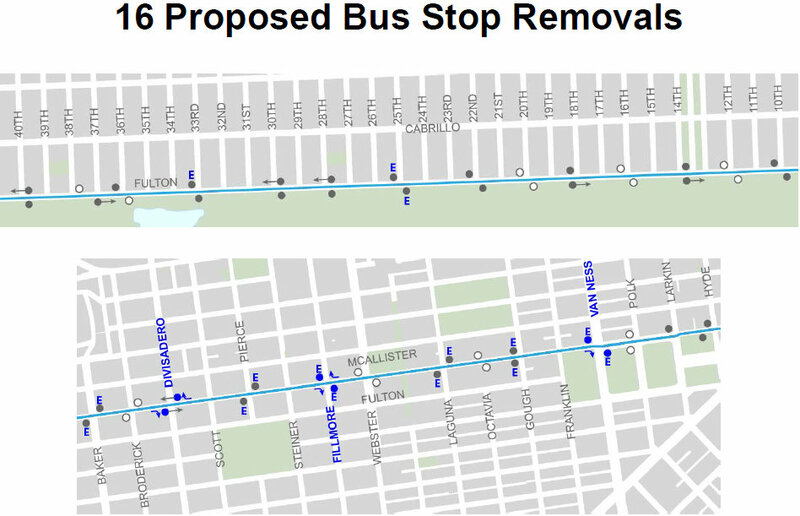 I understand that consolidating stops affects some people who have a hard time walking an extra block but ultimately it has a greater good for the city in improved service. There goes my parking. Lost 8 or 9 spots on my block alone. 1800 McAllister. Sorry for your loss. Thanks for your sacrifice. Meanwhile, on the other side of your block on Fulton, two block faces of parallel parking were converted to perpendicular parking, adding possibly more car parking overall to the immediate area.